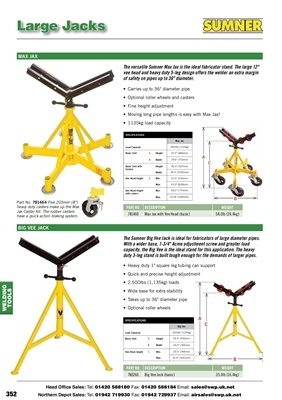 The Sumner Big Vee Jack is ideal for fabricators of large diameter pipes. duty 3-leg stand is built tough enough for the demands of larger pipes. The versatile Sumner Max Jax is the ideal fabricator stand. The large 12"
of safety on pipes up to 36" diameter. •	Moving	long	pipe	lengths	is	easy	with	Max	Jax! have a quick action braking system.